We view gamification as an essential component of performance management and TouchPoint One's A-GAME has enabled us to intelligently and effectively fight attrition, attendance and morale challenges to boost performance across all of our KPIs. 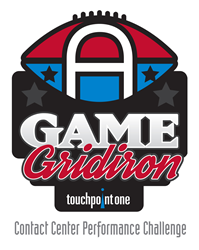 TouchPoint One, the leading provider of employee engagement and performance management solutions for contact centers, today announced details for Gridiron IV, the fourth season of the American football version of its A-GAME performance challenge. A-GAME is the cloud-based SaaS performance gamification solution that uses sports and other themed competitions to transform large customer contact operations into aligned, engaged, performance leaders. Gridiron IV kick-off is September 1. A-GAME automatically facilitates round-robin tournaments and single-elimination play-off stages that culminate in a season end championship. At the start off each matchup, team supervisors and Xtreme “fantasy” team owners select lineups from among their full agent rosters to compete against the starters selected by the leader of the opposing team. Scoring is tailored to each participating program or business unit and based on any combination of Key Performance Indicators (KPIs) ― attendance, quality, productivity, dollars collected, NPS and other CX metrics or balanced score. Game duration can be aligned to calendar weeks or pay periods and season length is completely configurable. Tangible and intangible incentives and awards can be leveraged to recognize and motivate employees in different ways. A-GAME offers a proven solution to address morale, retention, absenteeism and other key challenges and helps ensure that the contact center is adequately equipped to fulfill its increasingly vital role in an organization’s overall success. To learn more, visit the TouchPoint One web site or schedule a software demonstration. And follow us on Twitter @TouchPoint_One and LinkedIn. TouchPoint One is the leading provider of employee engagement and performance management solutions for contact centers. The Company’s Acuity product is a full-featured contact center performance management platform that enables improved decision making, talent development, and process execution at every operational level. TouchPoint One customer contact solutions deliver the rich benefits of gamification, balanced scorecards, employee dashboards and advanced performance management through innovative design and complete, functional alignment with business processes and strategies. TouchPoint One, Acuity, A-GAME and A-GAME Xtreme are registered trademarks of TouchPoint One, LLC. All other registered or unregistered trademarks are the sole property of their respective owners. © 2018 TouchPoint One, LLC. All rights reserved.